Posted on 4, April 2018 by EuropaWire PR Editors | This entry was posted in Automotive, Electronics & Machinery, Infrastructure & Utilities, Netherlands, Technology, Transportation & Logistics, Travel and tagged Amsterdam, bus, Connexxion, ELECTRIC, electric bus, Europe's largest electric bus fleet, fleet, Schiphol, Schiphol airport, Transport Region Amsterdam, VDL, VDL Citeas. Bookmark the permalink. Valkenswaard, the Netherlands, 04-Apr-2018 — /EuropaWire/ — Today, 28 March 2018, Connexxion, Transport Region Amsterdam and Schiphol presented Europe’s largest electric bus fleet. On 1 April, 100 electric articulated VDL Citeas will be put in service at and around Schiphol Airport and on high-grade public transport lines within the Amstelland-Meerlanden concession. Over the past weeks the VDL Citeas SLFA Electric have been phased into scheduled service. All the electric buses have the latest battery technology, which meets the highest and most stringent European requirements. These 100 electric articulated VDL Citeas will travel 30,000 km per day. The buses will be in service on six lines, 24 hours a day. Operational availability of the electric buses has been maximized through an optimized rapid charging concept. The batteries have an energy capacity of 169 kWh and can be charged with up to 420 kW power. This means that a fully discharged battery is recharged and ready for the next trip in 20 minutes or less. Charging downtime is therefore kept to a minimum. In addition to 23 Heliox rapid chargers (450 kW), located at 4 strategic charging points in the operation, there are 84 Heliox depot chargers (30 kW) at the depot. Each night the buses are slowly charged and pre-heated so they start operation the next morning with a full battery and comfortably warm interior. Charging is done via a pantograph on the roof of the buses. 2 Heliox mobile chargers (25 kW) are also used. 2 different versions of the VDL Citea SLFA Electric have been delivered to Connexxion. The R-Net buses have a 3-door configuration in the standard Citea exterior and seat up to 50. These buses will be put in service on 4 high-frequency R-Net lines between Uithoorn, Amstelveen, Schiphol and the Amsterdam city centre. 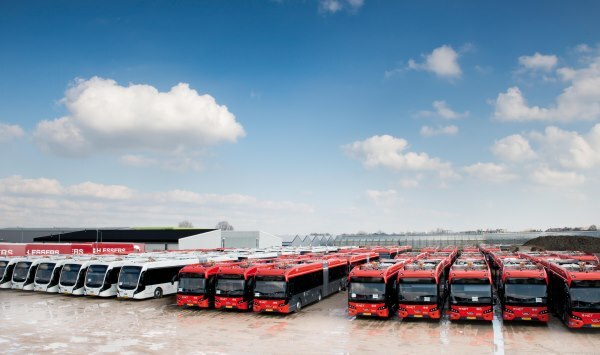 The buses for Schipholnet will operate on 12 lines at and around Schiphol. These buses have been built in the futuristic BRT design. The 4th door in this version further optimizes the passenger flow on these buses. All the buses have a spacious driver’s cockpit. The driver is optimally informed about the driving performance and current status of the vehicle via the standard digital electronic interface cluster. Passengers enjoy the additional luxury of comfortable deluxe seats, Wi-Fi and USB connections. VDL also played an important role in the project management involved in the implementation of the electric bus fleet. To provide a virtually turnkey solution, Connexxion, VDL and Heliox cooperated closely from the time the contract was awarded. From the very beginning they looked beyond just the practical implementation and considered where the best opportunities for infrastructure development could be found. VDL Bus & Coach also bears overall responsibility for the fleet systems. In this type of complex project, close cooperation between various parties is an absolute prerequisite for successful implementation. Connexxion and VDL had already worked together successfully during the introduction of the 43 electric articulated Citeas in Eindhoven. Since 11 December 2016 every bus has travelled 350 kilometres per day. Altogether the 43 buses have driven nearly 4 million kilometres. The operational advantages of high-performance battery technology in combination with quick charging solutions have already been demonstrated there. With the deployment of these zero-emission buses, the public transport at and around Schiphol is now much more environmentally friendly. The buses emit no harmful substances and make much less noise than regular buses. The Amstelland-Meerlands concession runs until 11 December 2027. The 100 electric buses currently deployed are the first phase of a transition to a total of 258 zero emission buses in 2021.